TradingView Review - Are The Pro Plans From This Service Worth It? While stock charts can be intimidating at first, knowing how to read and interpret them is very important to any trader or investor. And the best way to perfect your skills is through investing in the best stock charting platform. Not only can the best charting platform help you remain up to date on stock prices, but it can also help you make precise investment decisions. Of course, the best charting platform depends on the tools you need to analyze stocks. But since there are plenty of charting platforms available on the market with different features, pros and cons, today we will be reviewing TradingView, one of the platforms that seem to offer an extensive list of tools compared to the rest. TradingView is a stock charting and analysis software available in both free and paid options. 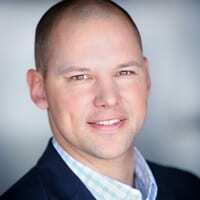 It was co-founded in September 2011 by Stan Bokov and a group of traders and software developers, therefore, it is still relatively new in the game. According to TradeView, traders can view price charts for different financial markets and a wide range of asset classes including stocks, currency pairs, commodities, cryptocurrencies, futures and even bonds. Besides that, users can view multiple assets like overseas markets futures including the Japanese Nikkei futures, Euro/Dollar currency pair, crude oil futures, bitcoin (BTCUSD) and gold right from the TradingView platform. In addition, the platform claims to have some powerful set of publishing tools as well as social media interaction features. Social media integration enables traders and investors to share thousands of trade ideas and their technical analysis with other traders all over the world. Also, it uses cloud-based technology that allows traders to access the site from any mobile or computer device. And another thing, the platform provides all its features and tools through a downloadable app and in a browser for ease of use. Traders can, therefore, view candlestick charts and even perform their technical analysis right from their mobile devices. Although it is not advisable to trade solely from your phone, the app allows you to keep track of trades especially when you’re away from your desk. The stock screener is an extremely useful search tool for both active traders and investors as it enables them to filter stocks based on specific criteria. TradingView screener boasts over 100 search fields and offers access to real-time alerts in both foreign and US markets. Their stock screener enables users to search for every instrument available and its chart as well as add filters. The filters are designed to help you find the stock you would like to trade or program your own if you feel like. Traders can search and sort stocks based on fundamentals, technical indicators or both. Overall, it is a good tool, but we feel it still needs some improvements like the ability to save your scans for future use. This is yet another powerful feature of TradingView. Traders can set alerts for every imaginable condition. For instance, users can set alerts on categories like price levels, indicators, custom conditions, and even drawing tools. The feature is quite versatile and provides traders with at least 10 different alert conditions in each of the categories available in order to set the alerts. You will then receive the alerts via audio signals, SMS, popups on your screen or email every time there are stocks that match your criteria. TradingView makes the experience of using the platform your own by providing several customizable options. 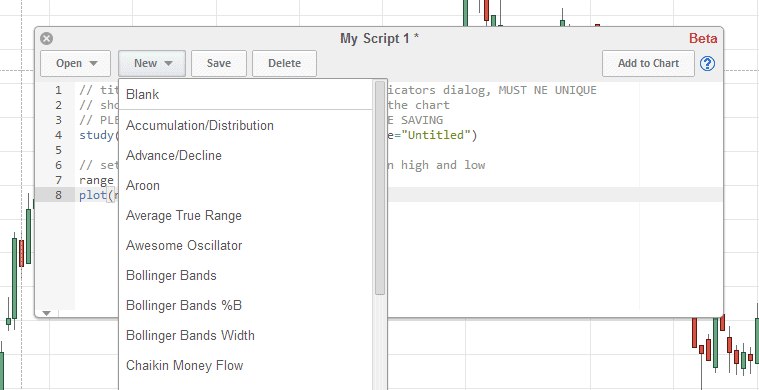 Using pine script tool, users can create their own indicators from scratch for a more detailed analysis of the stock market. The tool also allows you to edit and customize the codes for embedded charts, existing technical indicators and all kinds of trading concepts. Traders can also backtest their own strategies and use some available scripts for their trading. But in case you don’t feel like creating your own, there are over 100 pre-built studies to choose that allows in-depth technical analysis. 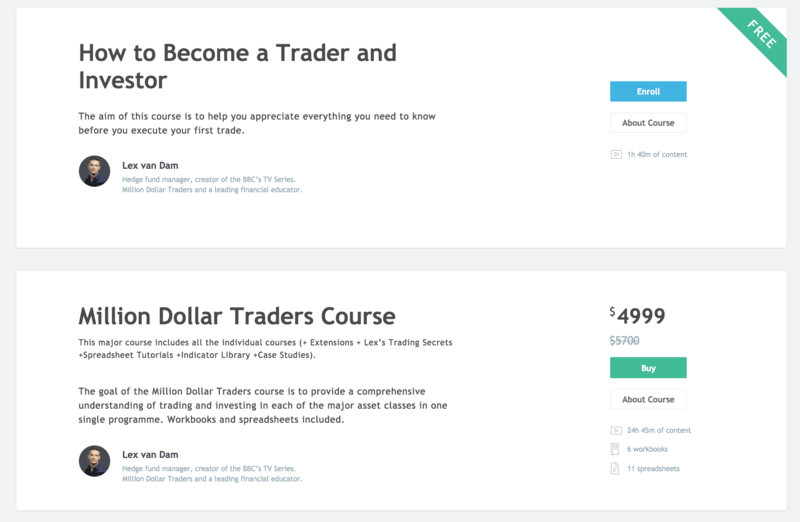 Furthermore, TradingView promises that it is easy to perform all kinds of customizations you want. The platform provides a wide variety of charting features that are easy to navigate. Traders can easily analyze the technical aspects of a certain chart and even look up for the current trading price. From chart comparing feature to various indicators and different charting prices, this feature can be a valuable tool for any trader whether beginner or experienced. The charts can also be resized in real time and users can add indicators, change the interval plus anything else they would like. TradingView also includes more than 50 intelligent easy to use chart drawing tools in all its plans. The tools are designed to help traders keep close tabs on how chart patterns unfold and what price action is doing. Another notable feature of TradingView is its paper trading capability. 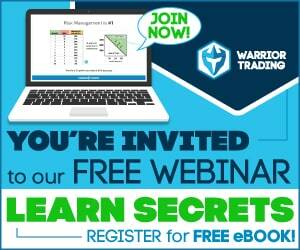 This feature comes in handy for new traders who are not well versed in trading. Through paper trading, traders can trade with virtual money in a simulated environment and practice their trading strategies without having to risk their hard-earned money. In addition, traders can paper trade any of the assets provided on TradingView website including cryptocurrencies, futures, and stocks. The only downside with their paper trading simulator is that there is no level 2 data which is a very important feature for day trading. TradingView also offers an easy-to-use phone app that is free for download. With the app, users can stream real-time quotes anytime, discuss and even respond to private messages conveniently. In addition, it is easy to access your saved charts from anywhere via the app. TradingView features a very intuitive interface that is both sleek and clean. Navigating through the site or their app is also easy and fast. Users can easily find what they are looking for in less than a minute. Even within the charting tools, new traders will find that everything is easy to understand. We have found that it only takes a few seconds to find what we are looking for on the site using the search toolbar. The platform even allows users to narrow down their searches. Users just have to choose whether their search is in the scripts category, trading ideas category or educational ideas category. So overall, if you have ever used other charting tools, you will be sure to appreciate the effectiveness of TradingView’s interface. 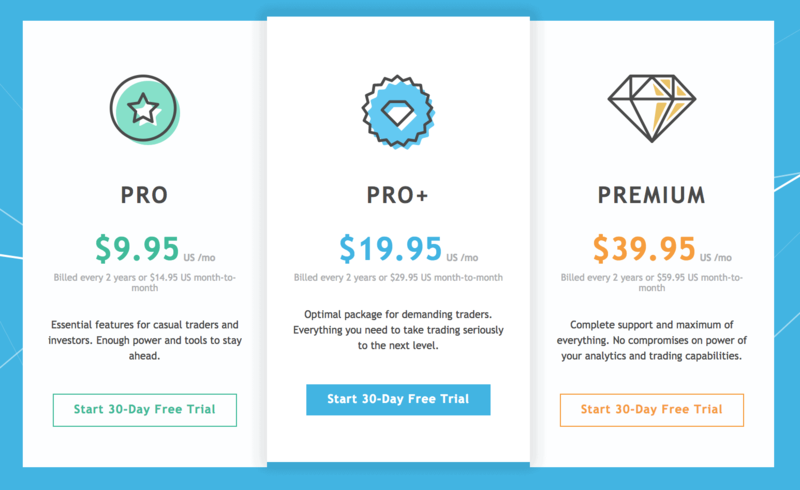 There are four subscription plans at TradingView including Free, Pro, Pro+ and Premium plan. The free plan offers limited features and allows users to link their account to Facebook or Google. 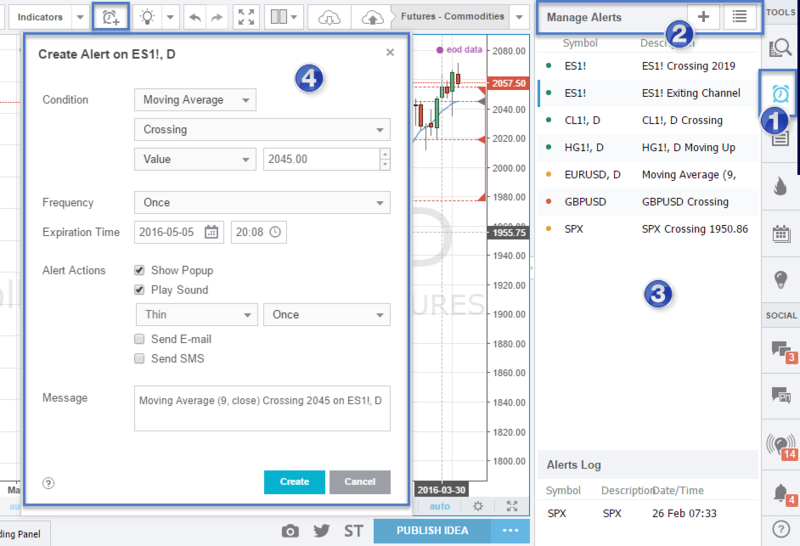 It features single server-side alerts, one chart per layout, three indicators per every chart, enhanced watch lists, stock screener, pre-built technical analysis and private idea publishing. Users can also enjoy powerful price scales, at least one saved chart layouts, over 50 drawing tools, real-time context news and multiple symbols per chart all for free. It is, therefore, an excellent option for traders looking to save every coin they have and still learn some basic trading techniques. Compared to the free plan, this plan offers two charts per layout, at least 10 server-side alerts, 5 saved-chart layouts and indicators per chart, unlimited watch lists and indicator templates and more real-time data choices. In addition, members can enjoy fastest data flow, dedicated backup data feed, no ads, volume profile indicators and 2x as much data as possible on charts. All these features for $9.95 per month billed every two years, $12.95 per month billed once a year and $14.95 billed every month. This plan costs around $19.95 per month when billed every two years, $24.95 per month if billed annually and $29.95 per month if you choose to have it billed every month. The plan offers tons of advanced features including 4 charts per layout, 30 server-side alerts, up to 10 indicators per chart, 10 saved chart layouts, fast customer support and ability to use two devices at the same time. Besides, it includes all other features in the Pro and Free plan and removes ads making it a huge upgrade compared to the Pro plan. Finally, we have the Premium plan which is quite expensive although it boasts some great features. For instance, if you subscribe to the plan and have it billed to you every two years, you will be paying $39.95 every month. However, if you choose to have it billed every month, then you will have to pay around $59.95 which is extremely expensive but probably worth the price. The plan features up to 8 charts per layout, 25 indicators per every chart, over 100 server-side alerts, priority customer support, server-side SMS alerts, extended trading hours and intraday spread charts. Also, members can enjoy unlimited saved chart layouts, 24 indicator on indicator, ability to use five devices at the same time as well as all other benefits in the Pro+ plan. Is TradingView Worth the Money? In our opinion, it is worth the money because it has almost all the charting tools traders and investors need. Whether you are new to trading and you just want to learn the basics or you are an experienced trader looking to better your trading skills, TradingView is a good place to start. And you don’t have to worry about risking your money because you can access the platform for free. Of course, the free plan has limited features but it will help you get a good insight into how TradingView works. In addition, you can take advantage of their 30-day free trial if you want to find out if any of the plans is worth to invest your money in. And if you don’t find it worth the money, you can always cancel your subscription immediately and you will lose nothing. One of the main benefits of using a web-based stock charting service is that you can always monitor different stock prices from anywhere, in real-time and using any mobile device. And TradingView promises just that and more. Whether you want access to technical indicators, stock screener financial charts, forex signal finder or simulated trading, TradingView offers you plenty of great tools for free. Besides, the platform is well organized which makes for an excellent user experience plus there’s a 30-day free trial for the premium packages making it a pretty attractive deal. Like any other trading phenomenon in the world, TradingView enjoys a fair share of merits and demerits. Weighing the two, the screener’s merits seems to slightly outweigh the demerits. StocksToTrade Review: To Use It Or Not?